Lately, I haven’t made much time for leisure reading, other than during my 30 minute lunch breaks on weekdays. However, I started reading Sole Sisters: Stories of Women and Running by Susan Warner and Jennifer Lin and couldn’t stop. I literally took the time the past two evenings to devour as much of the book as I could on top of the two lunch breaks I took to read this one. This book is a fast read. In total, I think it took about 4 hours to read on my Kindle. I laughed out loud, I got teary-eyed and I smiled. It made me want to run. It made me happy that I can call myself a runner and it made me think maybe signing up for a half marathon next year isn’t completely crazy. All of the women who share their running stories are so very different in age, ability and how they got started. However, the very core of why they run are similar and in many ways exactly the same. We meet a teenage track star, a seven year old girl, a seventy five year old nun and a divorced single mom. All have very different lives but all run for themselves, their health and their sanity. If you’re looking for inspiration to fuel your own passion for running, this book delivers exactly that. 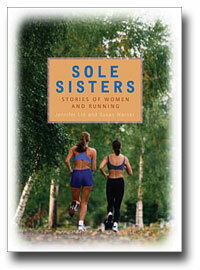 You can purchase Sole Sisters: Stories of Women and Running on Amazon.com in both paper and electronic form.